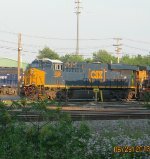 Description: Here is a side view of ES44AH 3095 as it pulls CSX Q438 past. Description: CSX Q438 passes through Ridgefield Park with ES44AH 3095 and SD70AC 4817 on the point. Description: New GEVO in the lead. Description: ES44AH 3095 and SD70AC 4817 haul CSX Q438 as it trundles north through Ridgefield Park. Due to the trespasser incident, this train would end up being tied down on a siding in Teaneck. Description: At this time, this was one of the newest GE's on the roster. Description: Q310 leaving the center siding at Vauces with a brand new GEVO leading the way. Title: CSX 3095 leads the Grain Train. Description: Oil train power rests in the evening sun at Pan Am's Rigby Yard. Description: CSX 3095 - 5471 - BNSF 690 rests on Track 217 at Rigby Yard. Description: L128-01 comes east through Woodbourne with old and new GEVO power. Title: The new kid still looks good. Description: Loads pass empties at 2015. Description: CSX Q438 with a few month old GEVO and an older CW44AC cousin have no problem tackling Old Hundred Hill on the former SAL Wilmington Subdivison. Description: Q-170 power siting on the TOFC Loop Taft yard Orlando Florida. Description: X980-20 notches up westbound through Woodbourne with CSX ES44AH 3095, CSX C40-8W 7922 and pipe loads for Woodbourne Yard, and eventually Fairless. They would shove their train in the west end of the yard at Fairless Junction. Description: C964-28 crosses Woodbourne Yard as they make their way up the Fairless Branch towards CP John and Morrisville with some rare power for this run, including CSX C40-8W 7922 leading CSX ES44AH 3095, the same power from X980-20.